Today I finally got round to adding most of my new origami book acquisitions of the last half year. 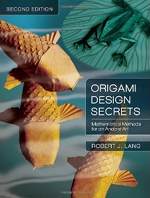 Amongst them is also "Origami Design Secrets, Second Edition" by Robert J. Lang. As someone asked whether it was worth the buy if you already had the first edition, I figured it'd be helpful to point out some differences and my thoughts on the question. The first thing you notice when holding the second edition is that it's heavier. That's no surprise, as Robert Lang made some substantial changes - much to the joy of many origami enthusiasts. The first edition impressed with 594 pages full of high-quality content going into techniques, mathematics, and folding instructions. The second edition tops that by an extra 176 pages, an extra 30% of content! It's noteworthy that chapter 14 on algorithms (10 pages) from the first edition was removed in the second edition. While very mathematically inclined may have enjoyed the mathematical formulas and very theory-heavy chapter, I believe for most origami enthusiasts the tradeoff of removing this chapter to make space for other content was a good one. Chapter 7 has more detailed instructions for the scaled koi. Chapter 12 on box pleating was greatly expanded. Two new chapters on uniaxial box pleating and polygon packing were added. Four new diagrams for a dancing crane, a silverfish, an elk, and the well-known organist were added. 12 crease patterns were added (in the chapter on polygon packing). Small errors were corrected and a new color scheme was chosen for more clarity. Altogether, this wealth of new content definitely makes it worth buying the second edition - even if you already have the first edition. As to if you don't have either edition: I'd recommend going for the second one. and, of cource, Thanks to said I've done a good choice! Thanks Sara for this add. I wasn't aware that Lang did a 2nd edition and I was about to bough the 1st one. Your description of this book is really good and made me choose this one instead of the 1st one and I must say that I'm very happy with it. Again, thanks for your dedication for all of us Origami lovers. Wow, this is very cool. When things like this are shared with the rest of us it makes us want to share as well. Origami is really an awesome form of art even though many call it a craft, I think it is very artistic. I picked up the first addition as I was rediscovering origami teaching it to elementary students in an after school program. My introduction was in high school, something with a bunch of folds by Tomoko Fuse, I can't remember the title. I dabbled a little in college, gaining a huge amount of respect for the diagramming abilities of John Montroll (My degree was in 2d/3d drafting, so I notice the details and nuances of diagrams). While teaching hords of eager youngsters how to read origami diagrams, using "Teach yourself Origami" by John Montroll I found myself wanting to know more about design. The first edition of "Origami Design Secrets" filled my mind with some much wonder, fascination, inspiration and respect that I can imagine nothing but wonderful things from a second edition. As a side note I am glad to hear there are more instructions on that $#@&*$(&@ koi! His embellished version of the turtle from the same chapter took me 3 tries, and I never managed to get the koi to look right. I just got my one today and I must say that you were not exaggerating when you said that this a a better book than the first edition! (Not to degrade the first one of course), Just one thing though, you said that there was only THREE new diagrams when there actually FOUR, (the fourth being the dancing crane). But thats all I think, Thanks very much for the review of this book an I hope you keep doing these! Thank you Sara for your reviews, always very interesting. But I thought that for this book, I would be the one with the negative opinion, because I bought it and I am really disappointed. I find no matter how complex your model, it has to have an esthetic value - folding something just for folding is not enough, the result has to have a little something that makes it among the beautiful foldings, or at least the nice ones, or the funny ones, or the tricky ones, etc. And I have to say, except for the Fish on the book cover (which is a good design and the reason why I bought the book, thinking it would be the same for the models inside), all the model cruelly lack of beauty. So, I have got a book which a lot of very complex and rather ugly, or at the very least not really nice nor elegant models - or very common - or with unfit proportions - or very stiff - well, all models that one doesn't want to fold, all the more when it would mean spending hours with complex diagrams and explanations. So, I thought there should be a negative opinion too, for people who think of buying this book, so that they have heard from both sides. Hm, the look of models is definitely a matter of taste. If you're not interested in the theory of how patterns can be used to create models (a huge part of ODS! ), and you don't like the look of the models - sure, this book is not for you. However, it's quite easy to at least judge whether you like the models diagrammed in the book. E.g. check http://www.happyfold... and http://www.happyfold... for some pictures and links, including pages that list all models diagrammed in the book - plus pictures of folds (e.g. http://origamidb.sta... and http://www.giladorig...).